Letting go is a hard thing for me. It’s on this day, the last day of the year, that I have to decide what to let go of. I can’t carry everything from last year with me in 2014. 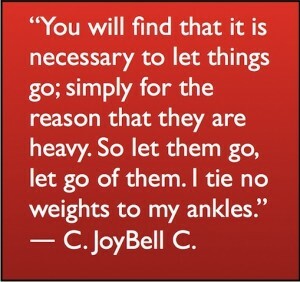 Two things I know I have to let go of are my failures and my successes. Neither of those can go with me into the new year. The more difficult and the more dangerous things to keep are my my successes. Success in itself is fleeting but holding on to past successes gives me a false sense of security, that everything is alright when it might not be. I have to re-frame success for a new year because the challenges to achieving success will be new. I think letting go is hard, for everyone, because we are afraid. We are afraid that next year’s successes will not be as good as this years success and that next years failures will be worse than last years failures. We have hope issues. “Therefore, since we have been justified by faith, we have peace with God through our Lord Jesus Christ. Through him we have also obtained access by faith into this grace in which we stand, and we rejoice in hope of the glory of God. More than that, we rejoice in our sufferings, knowing that suffering produces endurance, and endurance produces character, and character produces hope, and hope does not put us to shame, because God’s love has been poured into our hearts through the Holy Spirit who has been given to us. I guess then we have two options: Hold on to last years sin, last years dreams, and last years failures and so sabotage any hope of change in the new year or believe what God says about us in His word. Hope does not disappoint when it is placed in God and hope is the only thing worth taking into the new year. 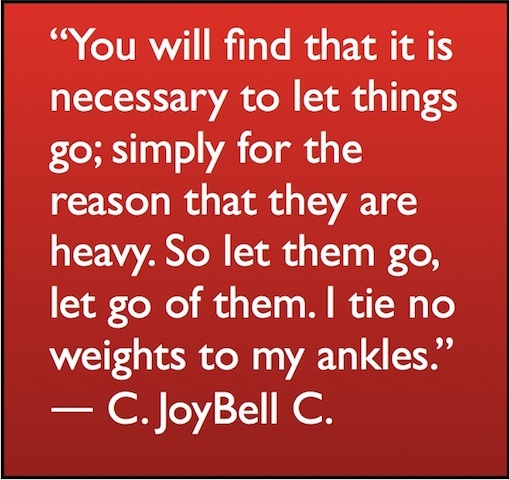 What are you letting go of for next year? What is worth holding on to for next year?